Cazenovia Creek model shows a low-cost solution to ice jam formation. Located in Hanover, N.H., next door to Dartmouth College, the lab has im- pressive specialized research facilities, including 24 low-temperature research cold rooms with a temperature range down to -35 degrees Celsius; the 73,000 sq. 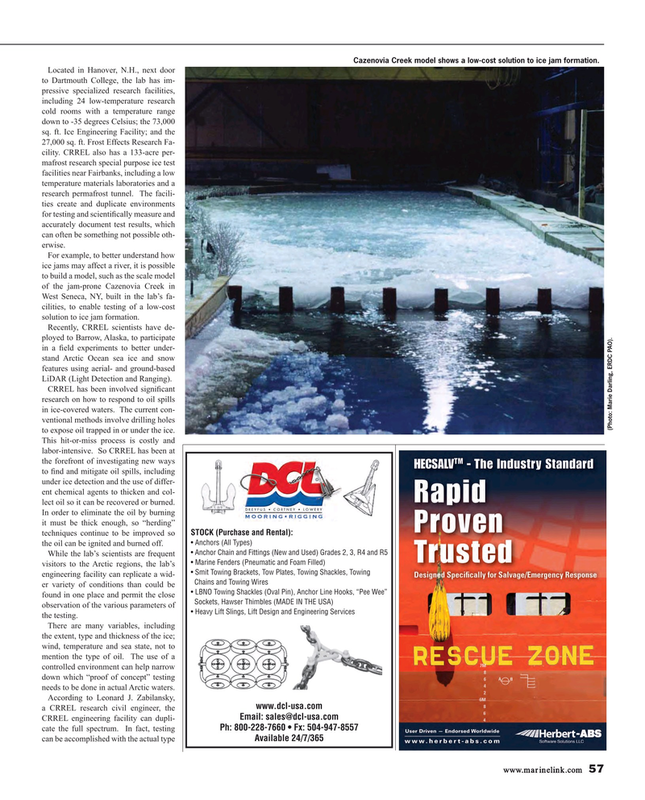 ft. Ice Engineering Facility; and the 27,000 sq. ft. Frost Effects Research Fa- cility. CRREL also has a 133-acre per- mafrost research special purpose ice test facilities near Fairbanks, including a low temperature materials laboratories and a research permafrost tunnel. The facili- ties create and duplicate environments for testing and scienti? cally measure and accurately document test results, which can often be something not possible oth- erwise. West Seneca, NY, built in the lab’s fa- cilities, to enable testing of a low-cost solution to ice jam formation. LiDAR (Light Detection and Ranging). CRREL has been involved signi? cant research on how to respond to oil spills in ice-covered waters. The current con- ventional methods involve drilling holes (Photo: Marie Darling, ERDC PAO). to expose oil trapped in or under the ice. This hit-or-miss process is costly and labor-intensive. So CRREL has been at the forefront of investigating new ways to ? nd and mitigate oil spills, including under ice detection and the use of differ- ent chemical agents to thicken and col- lect oil so it can be recovered or burned.